Donald Fauntleroy Duck was created in 1934. He was first thought up after Walt Disney overheard Clarence Nash doing his now famous duck voice for the first time. At the time, Nash was demonstrating a variety of voices he could do. Walt Disney decided to hire Nash to do the voice of a duck character that would take over the role of some of the negative attributes that Mickey used to portray, but now with Mickey being a role model, could no longer do. Donald made his debut in “The Wise Little Hen” where he and Peter Pig tried various means to get out of doing work, such as faking stomach aches. Donald Fauntleroy Duck soon became one of the most famous cartoon characters in the world with Nash doing the voice of Donald, even in foreign language adaptations. 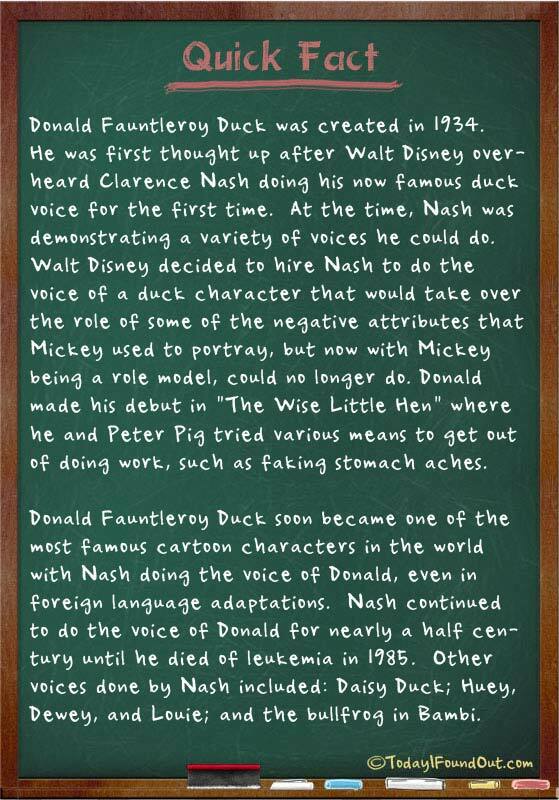 Nash continued to do the voice of Donald for nearly a half century until he died of leukemia in 1985. Other voices done by Nash included: Daisy Duck; Huey, Dewey, and Louie; and the bullfrog in Bambi.